Don’t let the wide Harlem avenues and neon-lit side streets fool you. Marvel’s Luke Cage is a Western. Its ex-con hero washes dishes and tends bar at a nightspot after dark and mops floors at a barbershop during the day. But in his heart, he’s a gunfighter who swears he’s left that life behind. He can cut and shoot and blow things up, but his deadliest guns are his arms. We believe him when he says he’d rather be a neutral observer. Plenty of blood is spilled in this series, but not by Luke — not at first, anyway. When he says, “Those days are behind me,” you know it’s an Eastwood-ism — his version of Unforgiven’s “I ain’t like that no more.” His is an ancient conundrum — a cliché, really: doing what a man’s gotta do, 2016 edition — but when an old tale is told as confidently as it is here, you embrace the tropes and luxuriate in the details. If the totality of Luke Cage were as mesmerizing as the hero and his neighborhood, it might be the program of the year. The show is yet another example of Netflix bloat: not enough story to warrant a 13-episode season. 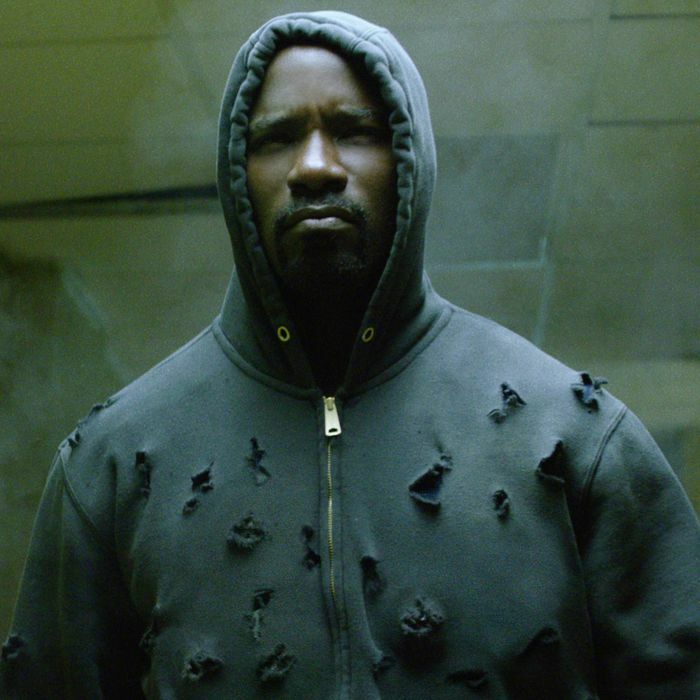 Granted, part of what distinguishes Luke Cage and other Marvel series from the movies is their willingness to linger inside a moment that’s entirely about character, like the scene where Pops tells Luke that he grew up in Georgia and says the gathering tension in Harlem evokes the scent of storm clouds forming over farmland. McGuigan and the series’ other directors — a formidable bunch that includes Hannibal regulars Vincenzo Natali and Guillermo Navarro — aren’t afraid to drink in the atmosphere in a room, whether it’s as vast as Cottonmouth’s nightclub or as cramped as Pops’s barbershop. The crime-and-corruption story line is your basic Chinatown, not too different from the Jimmy Smits scenes in another Netflix drama, The Get Down. I’m not going to pretend the series is an immaculate aesthetic object. I could list more aspects of Luke Cage’s storytelling that could be better if you pressed me. But I won’t do it here, because this isn’t a story show, it’s a vibe show, simply told but not simplistic, confident but not overbearing. It’s a pleasure to enter this world, a pleasure to watch these magnetic actors ping-ponging the dialogue, a pleasure to watch McGuigan’s camera float through Stokes’s nightclub, a pleasure to see Colter posed against skylines like an onyx god. And I love the small, playful touches that enhance a scene’s mythic quality, like that creepy lamp that looms over Stokes’s desk like the Eye of Sauron, and the Lynchian velvet drapes in the background of his private balcony, and the way series composers Adrian Younge and Ali Shaheed Muhammad drape a spaghetti-Western choir across Colter’s shoulders. Luke Cage is like one of those vainglorious 1970s double albums that has way too much filler but that you still listen to all the way through because the musicianship is superb. It’s a superhero slow jam.